Continuing with my habit of profiling Brubeck albums that are less-known, here’s another rather obscure album that Brubeck appeared on. Literally. If Paul Desmond isn’t on hand, and another horn player named Bill Smith takes his place, is it still called the Dave Brubeck Quartet? Or perhaps it’s the Bill Smith Quartet? Who’s Bill Smith, anyhow? Where’s Paul Desmond? What’s the meaning of life? And what gives with that odd album title? Maybe there’s a reason why this album is obscure… Actually, the music on this album is swinging and upbeat, and also unique in that each tune utilizes only modes, not conventional chord changes. Consider it the West Coast answer to Miles Davis’ album ‘Kind of Blue’. Actually, let’s not compare; only appreciate. 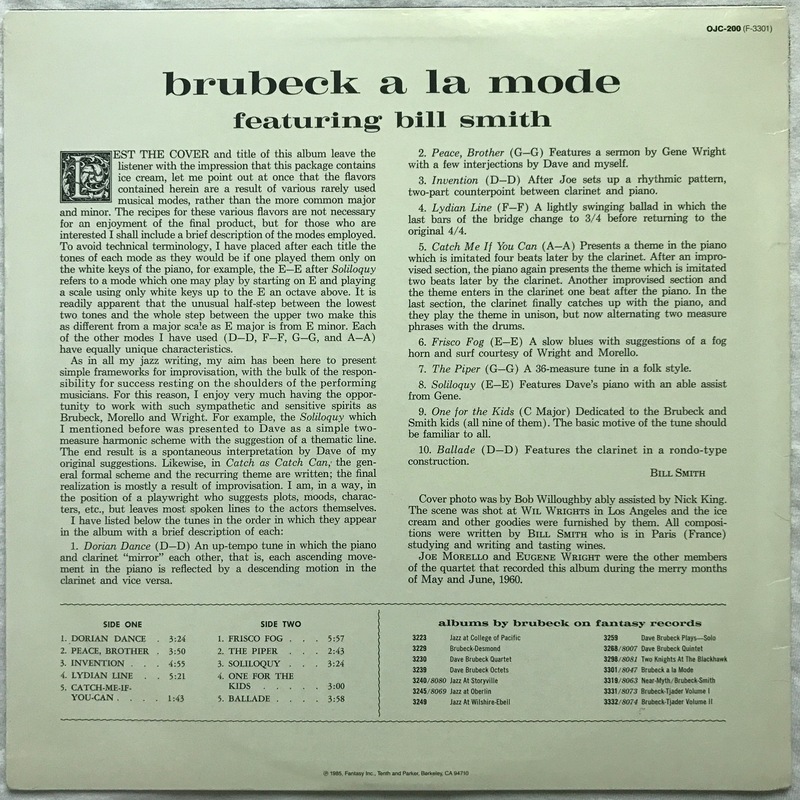 Bill Smith was an early friend of Dave Brubeck and a charter member of Brubeck’s group of college friends known as The Octet, which performed to no fanfare in the late 1940’s. He recorded with Brubeck’s group in the late 50’s and early 60’s, and then occasionally toured with his group in the 80’s up through Brubeck’s death in 2012. He was a technician and an innovator on his instrument, the clarinet, using computers and mutes to great effect. This album was the second of three albums released with Bill Smith in the horn chair, and the first of two recorded for the Fantasy label. The regular rhythm section of Brubeck’s quartet, Joe Morello and Eugene Wright, are on hand to keep things moving and grooving. As for where Paul Desmond was and why he sat out on these albums, I don’t know and haven’t been able to find an answer. They were showcases for Smith’s writing, so that may be a reason, although I would’ve loved to hear what Desmond could’ve done with some of these modal tunes. Bill Smith’s tunes are written in such a way that at times it’s hard to believe that they are all modal, based off one scale only. His clarinet is all modern jazz, no Dixieland. By the time 1960 rolled around, there weren’t many modern jazz musicians exclusively playing clarinet, which adds to the unique sound the music has. Brubeck sounds like a different pianist on almost each track, adapting his playing to both Bill’s style of playing and composition. The solos are rather brief, but full of taste and intrigue. The tune profiled above is, in my opinion, not only the best track on the album (and my favorite track on the album), but it’s also the most memorable. The head is familiar, and it’s catchy. Catchy like a rash. As much as I enjoyed the album, this track was the only one that lodged into my brain, and I found myself whistling that melody days and weeks and months later. Written with the children of Brubeck and Smith in mind, the tune opens with an eerie call and response of the familiar motif, tossed between the clarinet and the piano in steadily more complete phrasing. It sounds like it is in a minor key, an effect enhanced by Brubeck’s use of grace notes and the sustain pedal. Joe’s brushes set the pace and Eugene’s bass walks in and we’re off. It’s a fascinating exploration of a tune that I never thought could sound so melancholy. Or creepy. In movies, a children’s song played sparingly or in a minor key is never an indication that something good is about to happen. This track is (barely) a gripping and effective exception. Of course, Scott Yanow, our critic friend over at Allmusic, disagrees. Severely. Reviewing the album, he gave this modal exploration a paltry 2 stars out 5. His two-sentence review is a beautiful example of ‘damning with faint praise’. “The music generally swings and there are some fine solos but none of the individual pieces are all that memorable.” Yikes. I will concede that while the music is indeed pleasant and even sizzling at some points, most of them aren’t tunes that would make you whistle as you washed the dishes. This isn’t ‘Time Out’, that’s for sure. Hovever, he obviously didn’t hear ‘One For The Kids’. Maybe he was creeped out turned it off before it was over? As jovial as the fellas appear on this album, I have a sneaking suspicion that this wasn’t any of their ideas. Well, at least the picture itself. The missing contents of their malts shows they were fine with the dessert. The famed jazz photographer Bob Willoughby took the picture, with the help of Nick King. The store is a place called Wil Wright’s, in Los Angeles, California. 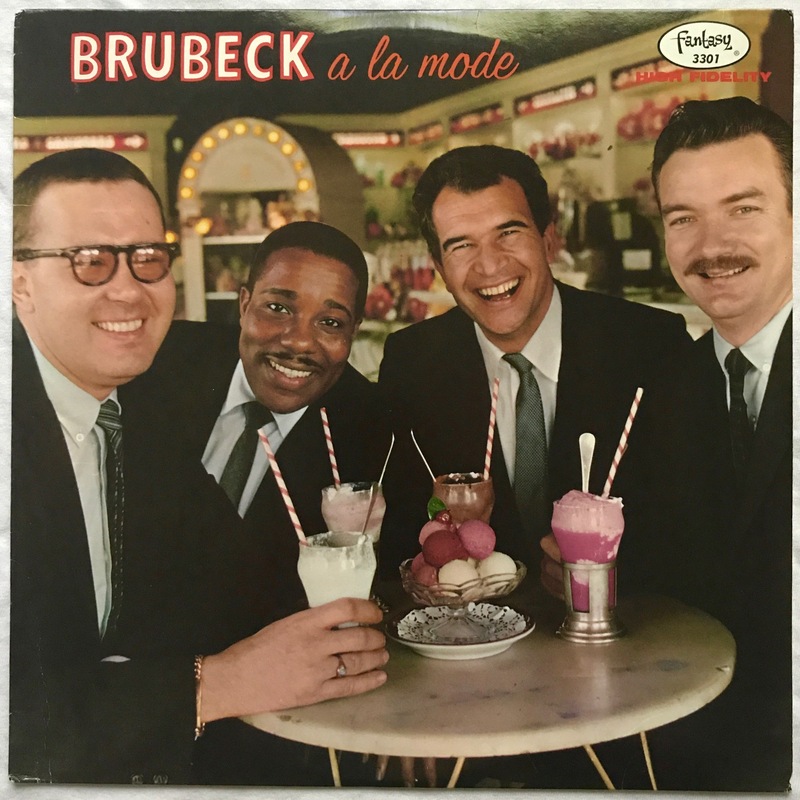 It’s delightfully corny, having the guys eating ice cream a la mode (wink wink nudge nudge), as well as delightfully of its time. I cannot imagine four grown men taking a picture like for a jazz album in 2017. In 1960, though? Sure! I have to say that it’s also nice to see that the establishment not only served Eugene Wright, but that he’s sitting in the inside of the group. I’m sure that was an added point of interest to record buyers in the early 60’s. The longer you look at this cover though, the more questions come to mind. Like, why hasn’t Bill started on his malt/milkshake while everyone else has made a dent in theirs? Where’s Dave’s glasses? What color are their shirts? In typical Fantasy fashion, the date of the recording session is casually given as “the merry months of May and June” of 1960. It can be safely assumed that this was recorded in California, most likely in Los Angeles, where the picture was taken. Bill Smith writes the liner notes, providing his personal insight and outlook on the proceedings. This is a 1985 reissue of the original album, and the vinyl shows it. It’s pressed on thin black vinyl, non-deep groove. The labels clearly show the Original Jazz Classics (OJC) catalog number, along with the original Fantasy album designation. An original record would be on red translucent vinyl with red labels, or translucent blue with blue labels for a stereo release such as this. Usually, it’s good practice to stay away from OJC reissues from Fantasy, but this reissue isn’t bad at all. Perhaps it’s because it’s Fantasy tape, and they treated it differently than, say, a Prestige tape. The sound is full and enveloping, and on good speakers or headphones, the musicians sound like they’re in the room with you, the clarinet on the right, Brubeck on the left, and the drums and bass permeating from the middle. It’s one of the better studio recordings from Fantasy that I own.